What happens to batteries and cellphones after you drop them off at a Call2Recycle® collection site? They begin a fascinating journey through the recycling process, with the metal and chemical byproducts eventually winding up in new products and the remaining waste safely disposed of according to international recycling standards. Call2Recycle follows three simple steps when recycling batteries and cellphones. You can also watch the process in action in this video. Click on the chart below to download it in PDF. 1 — Collection: Retail stores, small and large businesses, cities, towns and government agencies collect batteries (up to 11 lbs. or 5 kg) and cellphones at their locations. Collected items are then shipped to Call2Recycle’s responsible recycling partners. 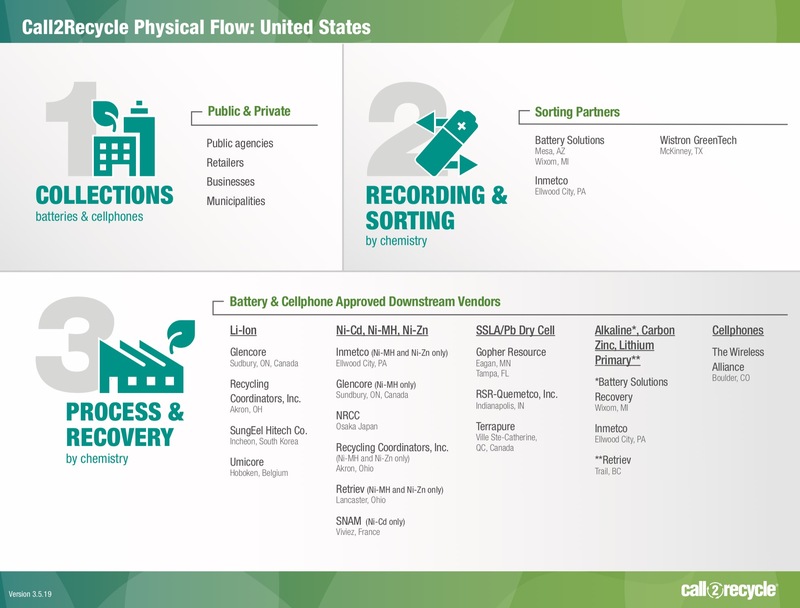 2 — Sorting: Battery Solutions, INMETCO and Wistron receive the batteries at their warehouses, record details about the weight and battery types of the shipment, then separate the batteries by chemistry. Cellphones are sent to the TheWirelessAlliance for recycling. 3 — Process and Recovery: The batteries are now ready to be processed. Specific chemistry batteries are shipped to appropriate specialty processors. The processors extract useable metals to be used in the manufacturing of new products. Waste products are responsibly and safely disposed of according to Responsible Recycling (R2) and Basel Action Network (BAN) standards. Cellphones are either refurbished and resold or recycled, with the proceeds used to fund the cellphone collection program and educational outreach.